An award-winning careers website that pushed the boundaries and created a unique employer brand presence. The Audit Commission wanted to be seen as modern, diverse and accessible. It wanted to engage with a wider social and ethnic pool in ways that didn’t feel quite so typically ‘public sector’. In particular, it wanted to challenge the misconception that it was full of dull, middle aged, male accountants’ which it so obviously wasn’t. We built an all-singing, all-dancing website. Conceptually it’s simple. Just as the Audit Commission makes sure public money’s spent wisely, you get to make sure your career’s spent wisely by joining. We peppered the site with words of wisdom, wise films (one animated, one talking heads) and all the other things worth wising up about the Commission. We also created animated figures who deliver little snippets around the site – they’re actually caricatures of some the people in the films. See if you can spot who’s who. The end site certainly was very different to what had gone before, and indeed to most other public sector bodies. The animated and talking head videos were incredibly well received as a short and concise description of what the organisation was all about. It certainly met the brief. 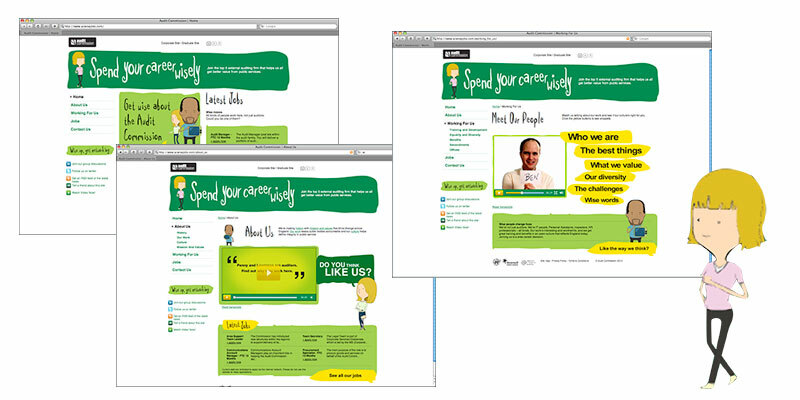 It also was nominated as one of the best website at the CIPD recruitment advertising awards. Click here to see the site.